Combine all ingredients in a large bowl. Mix well. Let mixture sit and absorb moisture for about 5 minutes. Form into mini patties. When ready to cook, heat a large saute pan over high heat until hot. Add enough oil to slightly coat the bottom of the pan. 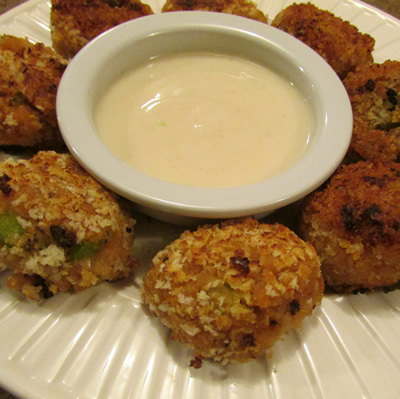 Dredge each mini crab cake in more panko breadcrumbs. Cook each crab cake over medium to medium-high heat until golden, flip once, and cook until golden. Place crab cakes on sheet tray and finish baking in a 450°F oven until the internal temperature reaches 165ºF. Whisk together sauce ingredients in a small bowl. Let sit 10 minutes to meld flavors. Place a small dollop on top of each crab cake and serve. Source: "Farmstand Favorites, Maple Syrup"
Recipe Notes: We found the crab cakes a little on the sweet side so we cut the original amount of maple syrup from 1/2 to 1/4 cup. Also, you can substitute maple syrup for maple cream in the sauce, but the sauce will be a little thinner consistency.